Text: They had made no plans for the rest of the day, and when Harney asked her what she wanted to do next she was too bewildered by rich possibilities to find an answer. Finally she confessed that she longed to go to the Lake, where she had not been taken on her former visit, and when he answered, “Oh, there’s time for that — it will be pleasanter later,” she suggested seeing some pictures like the ones Mr. Miles had taken her to. She thought Harney looked a little disconcerted; but he passed his fine handkerchief over his warm brow, said gaily, “Come along, then,” and rose with a last pat for the pink-eyed dog. Mr. Miles’s pictures had been shown in an austere Y.M.C.A. 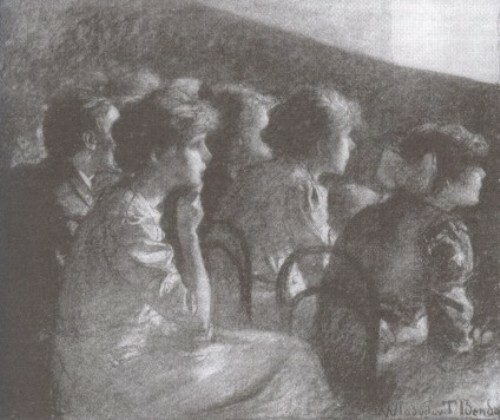 hall, with white walls and an organ; but Harney led Charity to a glittering place — everything she saw seemed to glitter — where they passed, between immense pictures of yellow-haired beauties stabbing villains in evening dress, into a velvet-curtained auditorium packed with spectators to the last limit of compression. After that, for a while, everything was merged in her brain in swimming circles of heat and blinding alternations of light and darkness. All the world has to show seemed to pass before her in a chaos of palms and minarets, charging cavalry regiments, roaring lions, comic policemen and scowling murderers; and the crowd around her, the hundreds of hot sallow candy-munching faces, young, old, middle-aged, but all kindled with the same contagious excitement, became part of the spectacle, and danced on the screen with the rest. Comments: Edith Wharton (1862-1937) was an American novelist. Summer is a novel about small town librarian Charity Royall and her affair with architect Lucius Harney. The confusion she feels in the cinema reflects her confused state in the early stages of her relationship with Harney. Wharton was antagonistic towards the cinema, but makes numerous references to filmgoing and film culture in her work. This entry was posted in 1910s, Fiction, USA and tagged Audiences, Curtains, Dark, Edith Wharton, Screens, Sweets. Bookmark the permalink. I’ve read Summer but I don’t remember this passage, thanks. I didn’t realize Wharton was critical of movies…she didn’t hesitate to sell rights to her books. The early films made of her novels don’t have a good survival rate, darnit. The House of Mirth is my favorite of hers. I also like The Age of Innocence, that’s more elegiac than her other novels although her irony is still firmly in place. She could be quite savage, in a well bred, teacuppy way.